…it’s easy in our increasingly secular world to ignore it or in the world of superficial piety to privatize it. But the word from God spoken by the prophet Isaiah brings a different message. Is not this the fast that I choose: to loose the bonds of injustice, to undo the thongs of the yoke, to let the oppressed go free, and to break every yoke? In fact, God warns those who are fasting and tearing their clothes to shreds that God is not impressed with all that. Only when the people stop oppressing their workers, blaming each other for their problems and breaking relationships within their own families will God respond to their prayers. It’s not a difficult jump to get from Isaiah to the Coalition of Immokalee Workers and Publix. A few weeks ago Trader Joe’s signed an agreement with CIW, only a few days before opening its first Florida store. So it’s still about Publix. Now, don’t get me wrong, I like my Publix store. I like the politeness of its workers. I like the cleanliness of the stores and the variety of the items they stock. I like their Buy One, Get One Free sales. What I don’t like is the arrogance of their leadership (they never responded to our letter and thousands of dollars of cash register receipts) and their unwillingness to even sit down and talk with the CIW leaders. In every situation that the workers of CIW have encountered for a decade now, when they are able to sit down and talk with the heads of fast food conglomerates, tomato grower associations and food supply companies, they were able to see each other’s humanity and dignity and to find a place of agreement. Yet Publix leadership refuses to sit down or to talk, which only says to me they know that theirs is a morally indefensible position and they can’t look the workers in the eye. In my sermons over the past months, I have focused on the difference between chronos time and kairos time. The old ways of chronos time are quickly disappearing and kairos time, God’s time, is upon us. The kin-dom is at hand. We can see that as old marriage inequality laws fall to the wayside, as old religious understandings of impurity disappear, as old oppressive political regimes and laws melt away. The unwillingness of Publix to sign with the CIW is the last vestige of the old agricultural order in the South which relied on slave labor and then share-cropping and segregation to support it. This too shall pass. The question for them is do they wish to be on the side of justice or oppression, the past or the future. During the week of March 5-10 many of the leaders and workers of the CIW will be on a fast at the Publix headquarters in Lakeland. We are invited to join them throughout the week and on Saturday, when they end the fast. I will join them to lead their religious vigil the evening of Wednesday, March 7. Rev. 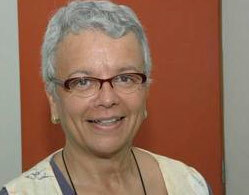 Bernice Powell Jackson of the First United Church of Tampa, and President of the World Council of Churches in North America since 2004. I invite you to join me there or join us in prayer that evening.